One of the great benefits of the way I experience grief is, my house gets cleaner. The news of the United Airways/Chicago police assault of an innocent passenger who just wanted to get home and to take care of his patients hit me hard. So out came the broom, off of the bed came the sheets — sweeping, mopping, while my brain and heart tried to process what had happened and why it filled me with such sorrow. In part, it’s an issue of trust. Can we trust the policymakers who exert so much control over our lives — including corporate policymakers — to prioritize our collective well being and happiness in their decision making process? The answer that day was, no: dollars matter more than people. That incident was on my mind a few weeks later as I prepared my remarks for the March for Truth rally in Montpelier, Vermont on June 3, 2017. Although Gross National Happiness USA decided not to co-sponsor the event due to its appearance of partisanship, as President of GNHUSA, I was eager to speak out about trust in governance. Not only is it one of the nine domains of happiness within the GNH framework, lack of trust in governance is a commonality across the political spectrum. Similarly, coming together to increase trust in governance by adopting a non-partisan GNH approach to community well being could be a shared path to happiness. “I want to do five things in my brief remarks: 1) broaden the concepts we’re discussing today; 2) share what this has to do with happiness; 3) step away from partisanship; 4) look briefly at the nub of the problem; and 5) share a long term solution. First, from a GNH perspective, we look at the issue not just as truth in government but as trust in governance, including corporate decisions which can have a major impact on our well being. We should trust, for example, that when we pay hundreds of dollars for an airline ticket, we won’t get dragged off that plane by police because the flight is overbooked. Obviously policies like that, and lies and deception from elected officials, make us unhappy. That’s why we’re here today. But there is also research. Gross National Happiness is a data-driven approach. Data found nine key areas where governments can create conditions that make us much happier or much less happy. One of those is trust in governance. In fact, Helen Russell reported in her book, The Year of Living Danishly, that trust in governance is one of the most important reasons Denmark consistently ranks as a very happy country. We also have data for this country, and Vermont. Vermonters rate trust in governance as one of our least happy domains, at least one it comes to federal governance. Throughout America, red state, blue, or purple. there is deep distrust of governance. We don’t necessarily distrust the same officials or believe the same “truths,” but this is a non-partisan commonality. Trust in governance could be a unifying principle. It could bring us together. So why such untrustworthy behavior? No doubt one reason is greed, which may be innate. I think think the real villain is the GDP-driven growth economy which demands greed for money and material goods, sometimes in the name of happiness. But it doesn’t work. Over the last couple of decades, the GDP has risen but happiness has flat-lined. You know what has risen? Suicide rates. For all age groups. Unlike the very narrow GDP goal posts of success, a GNH framework is comprehensive and inclusive. The idea is, you run policy decisions through a matrix to determine impact on the environment, equality, health, education and more — all the things that make us truly and collectively happy and well. Then, with holistic data, you can make the right choices. In 1968, during his ill-fated presidential campaign, Bobby Kennedy said of the GDP, it measures everything “except that which makes life worth while.” It’s just plain wrong, that that’s how we make policy! A government that took the people’s right to pursue happiness seriously; governance based on well being for all people — including future generations, and animals, and the planet; a government that valued those things which make life worth while — that would be trustworthy governance. I invite you to join the happiness movement by signing our Charter for Happiness at GNHUSA.org. * This is the line that got the most applause! I Wish I Was Walking for Happiness! A happy day in 2012 when I got to walk with Paula Francis (left) and Linda Wheatley (right). You’re probably familiar with the saying, “Happiness isn’t having what you want, it’s wanting what you have.” I’m not sure who said it, but this quote is so ubiquitous that you can even buy a wall plaque from Amazon emblazoned with this wisdom. I suppose that’s both good news and bad news. Good, to reinforce the abundance we already have. Bad, of course, because it’s all about the shopping!! Anyway, all week I have been feeling a low-grade yearning for something I don’t have — or, more precisely, what I am not choosing to do. There is plenty of joy and happiness staring me in the face with all that I have chosen to do. For the most part, I am not only appreciative of but sometimes also dumbfounded by my amazing life path. Still, I’m a little bit sad this week that I am not walking for happiness with my friends Paula Francis and Linda Wheatley. Okay, so be it. As my positive psychology teacher Tal Ben-Shahar puts it, “permission to be human.” I’m human, I feel some regret at the road not taken. Literally. Since this past Monday, when Paula and Linda began the third leg of their Happiness Walk, I have watched their Facebook and Twitter posts with anticipation, joy for them, and, my own pangs of desire. You see, I know from personal experience just how magical their walk really is. The Happiness Walk. Theirs is a very ambitious project! As co-founding members of GNHUSA, we all know how urgently we need, as their site puts it, “an expanded set of true progress indicators – one that views economic and material well-being as part of a broader definition of progress.” To get a better sense of what those indicators should be — ie, how to measure what really matters to regular folks in this country, in 2012 Paula and Linda decided to walk from Stowe, Vermont to the Jefferson Memorial in Washington, D.C. As they walked, they also listened — collecting stories day after day after day about what happiness truly means in people’s daily lives. You can see photos and listen to the stories at the Happiness Walk website — they are delightful and sometimes quite moving. 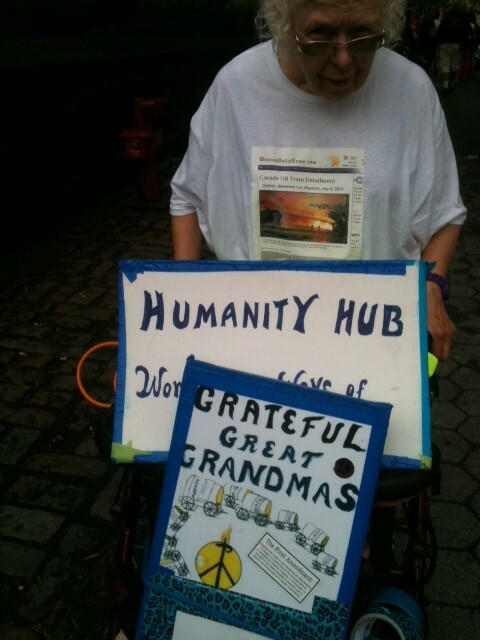 After a successful 2012 walk, in 2013 Paula and Linda set their sights on a week’s trek from Stowe to Montreal, Canada. Now, they have a much, much bigger goal: by 2017, they will have walked all the way to San Francisco and back! On Monday, they began this part of the project by prancing down the steps of the Jefferson Memorial and following the road toward Norfolk, VA. True confessions. I admit, at first I didn’t get it. Really, I thought it was a waste of time, energy, and money. I mean, we have a planet to save and a baby movement to grow! What good can be accomplished by just walking? Yes, Paula and Linda schedule some events along the way, but really, they are mostly just walking. How does that help? I didn’t even appreciate the value of collecting stories, because I didn’t see that as valid research. Just anecdotes — as in, so what? But then, they started reporting back, and I could just feel that something very special was going on. Turns out, the experience of listening to people about their deepest, most precious values — listening from a heartfelt place, with no request for money — is a profoundly moving experience for both the speakers and the listeners. What made me think this wasn’t valid qualitative data? Sure it is. Plus, wearing their special, brightly colored “Serious About Happiness” shirts, Linda and Paula shared love and gratitude wherever they went — and were everywhere showered with goodness and generosity in return. My turn to walk. Paula and Linda left Stowe in August, 2012. I finally joined them for two days southwest of Philadelphia, PA in October. 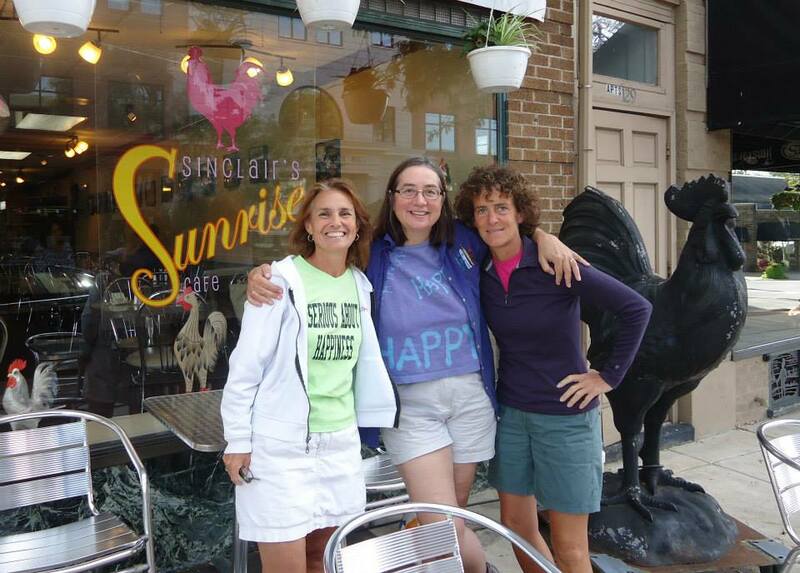 When I arrived, they were at a fabulous little cafe in Kennett Square, and I learned another reason the Happiness Walk is so special: food!! When you walk @ 20 miles a day, you get to eat a lot of goodies! Not only that, but at that cafe — as at so many others along their walk — the restaurant owner insisted on comping our check. As we walked, we took time to meditate, to talk with one another about the happiness movement and our own lives, and to answer questions from the various random strangers who stopped to ask what these “Serious About Happiness” shirts were all about. Even on the second of my two days, which turned out to be the rainiest one of the whole walk, the magic shone through. At a diner in rural Maryland, I got to be the listener, as the hard working waitress shared with me her stories of personal happiness. Magical! Both nights, our hosts were a family of five — all, until the moment we arrived, complete strangers to us. Friends of friends of friends, learning of the Happiness Walk through a church listserv, and volunteering to give us a place to sleep and sumptuous meals to eat. These five embraced us into their family, showering us with love and joy — all because we were walking for happiness, theirs and ours. Let me tell you, 20 miles a day is a lot of walking! Because I regularly walk the dirt roads around my house, I thought I was in pretty good shape, but, whoa baby. By the end of day two, I barely made it back to the house. Paula and Linda were practically carrying me, even though I had walked five miles fewer than they did (we met up at the diner). But, in pain, dripping wet, totally exhausted — it was as if the sun burst through when the children of our hosts came running out to meet us with hugs, happiness, and gifts of homemade duct tape jewelry. 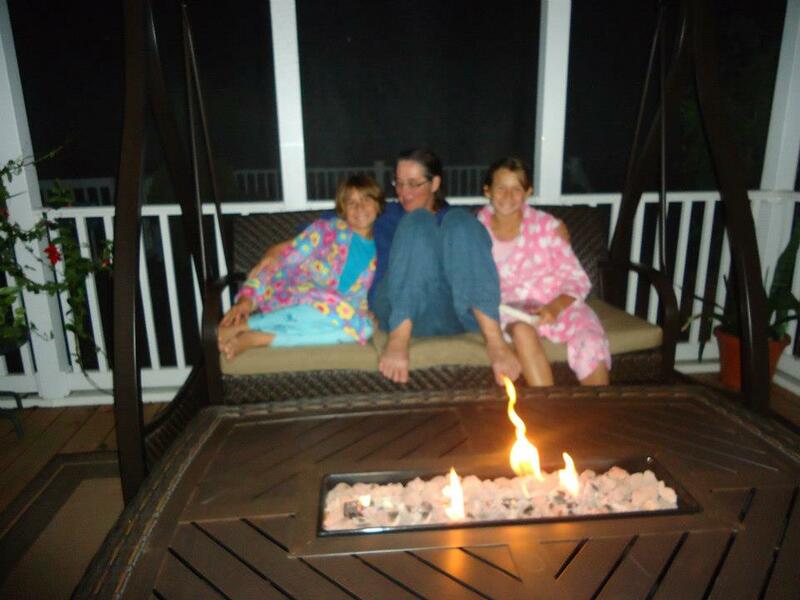 So do I want to be with Linda and Paula right now, soaking in more of that magic? Why, yes, I do. I definitely do want that. But it is not to be. Not right now, at any rate. Not without cost. There is a price to pay for choosing to walkabout on a happiness mission. I, for one, lost two toenails as a result of my two day walk! LOL, that’s not important. But Paula and Linda are giving up a lot, especially time at home with their families and friends, and the opportunity to work at jobs where they could actually earn money (yes, we all still need money!). Indeed, it costs a lot of money to do what they are doing. Even though so much is donated, much is not — like trips back and forth to Vermont to reconnect with loved ones. Want to help with a donation? They’d love it. Want to walk with them? Or help with housing or transportation? I believe I can speak for them when I say, all help gratefully received. In the spirit of full disclosure, I should also add that I have a vested interest in Paula’s and Linda’s success on their highly aspirational walk. When my happiness gal pals meet with groups in all the many wonderful, varied cities they visit, they plan to offer me up as one of their resources — as in, I can come to these same cities and beautiful people for happiness skills trainings and sermons. It would bring me great joy to play that role, so for that and many other reasons — also coming from a place of love — I am cheering Linda and Paula on from afar. One of these months — maybe even more than one — I will again join them for a few precious days. In the meantime, let’s end on a musical note, with Pete Seeger’s “Step by Step.” The longest march can be won, together — singly none, singly none. Our new friend — a young lady we met on subway, then saw in the march seven hours later. Thanks to Paula Francis for this photo. Traveling to New York City for the People’s Climate March on September 21, 2014 was one of the best decisions I’ve ever made. Yes, it made me happy. Intensely, deeply, indescribably happy. I was absolutely in the right place at the right time — not only for myself, but for all life on our precious planet. I was flooded and overwhelmed with gratitude for everyone around me who made the effort to show up for this desperately needed wake-up call; pride that I was one of them; hope that maybe we can save the human race after all; and flat-out joy being in the presence of such a diverse, beautiful, celebratory crowd. From a science of happiness standpoint, there’s no question why I would feel such a high — a transformative high, I believe — from this march. Pick your happiness researcher and theory, and I can pretty much check it off the list. Mihaly Czikszentmihalyi and flow, or having a peak experience? Ha! This was a lifetime peak experience! Tal Ben-Shahar and his teachings on living in concordance with our values? Yes, big time. Barbara Frederickson and the positivity ratio? My ratio of positive to negative experiences that day was off the charts. Chris Peterson and the theory of greater happiness by acting from our personal strengths? My signature strength is the ability to give and receive love, and this day was all about the love. Positivity — oh, yes, everywhere, all weekend, even in the long long bathroom lines. Engagement — fierce engagement, with the issues, with the future, with the city of New York, with the people all around me. Relationships — yes, with the friends new and old with whom I was marching, and with all the other marchers, too — we were all connected. Meaning — are you kidding me? Fighting for the future of the planet? It doesn’t get any more meaningful than that. And accomplishment? The organizers of this historic march hoped for 100,000 participants and four times that many showed up — 400,000 of us! We did it! Even seniors who needed walkers showed up to march! Sunday, it felt like everyone did indeed show up. For so long, I’ve been wondering when Americans were going to rise up, take to the streets, and demand environmental and economic justice. Finally, finally, we the people were out in glorious, loud, forceful numbers. Yes, there were some justifiably famous climate warriors near the front of the march — like Bill McKibben, Vandana Shiva, and our own beloved Senator Bernie Sanders. They weren’t at the very front, though, because that spot was reserved for the indigenous peoples and others in the United States and around the world who are already suffering from climate change. I felt humbled to be marching behind these front line warriors. We need them, and they need us. You have been telling the people that this is the Eleventh Hour. Now you must go back and tell the people that this is the Hour. And there are things to be considered. Where are you living? What are you doing? They will feel they are torn apart and will suffer greatly. At this time in history, we are to take nothing personally, least of all ourselves. For the moment that we do, our spiritual growth and journey comes to a halt. The time for the lone wolf is over. Banish the word struggle from you attitude and your vocabulary. Sacred! That’s a piece I was missing — the march was sacred, and celebratory. We were all good to each other. We were all the leader. Perhaps coincidentally — perhaps not — just a few days after the march, it was announced that Bill McKibben will be one of the recipients of this year’s international “Right Livelihood” award in Stockholm this December. On a much smaller coincidental scale — or maybe we’re just all swimming in the same river — I used the Hopi prayer to open and close my first guest service at the Montpelier Unitarian Church. The thrust of that sermon was the need to cultivate personal happiness in order to better prevent and cope with climate change. Is this prayer speaking to many of us now? Is it part of your life? Me, Marta Ceroni, Linda Wheatley, and Paula Francis offering a new sustainable paradigm for people and the planet. Thanks to Marta Ceroni for this photo. 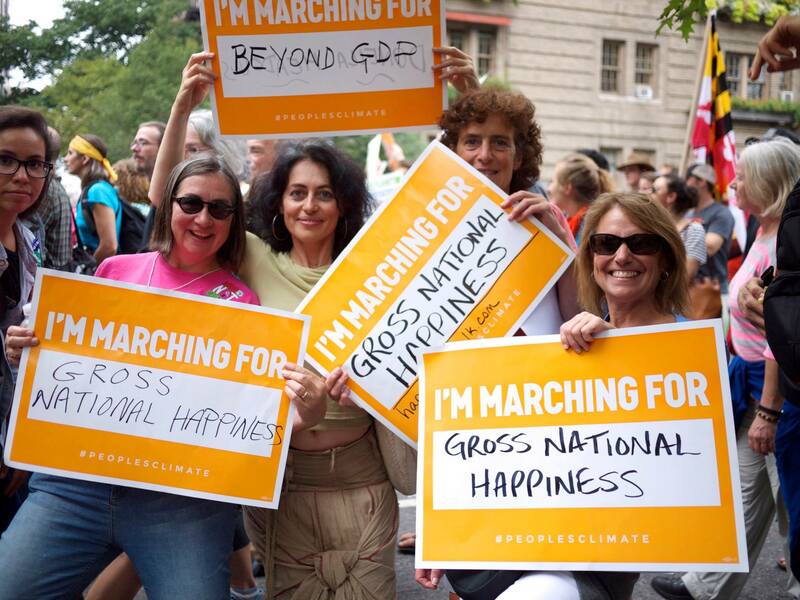 Something else that became clear to me on the march — or maybe during my conversations with Linda Wheatley on the train ride home — is that a gross national happiness paradigm is the road map we’ve been waiting for. 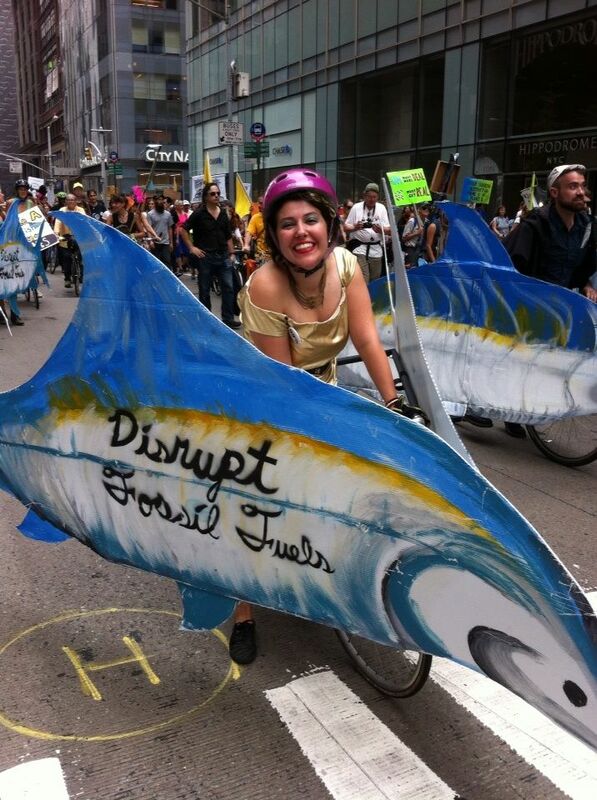 Both before and during the march, many people expressed their very strong beliefs that capitalism must be destroyed in order for the planet to be saved. I share their view that the current corrupt capitalist system is driving many destructive practices, environmental and otherwise. Further, we can obviously no longer afford a growth economy — a GDP driven economy is driving us over the climate change cliff, and causing massive unhappiness. Without a doubt, we need huge systemic changes. However, “down with capitalism” is not sufficient. If capitalism is destroyed, what will replace it? As Marta’s sign says, we need to move beyond GDP, to an economic system based on the well being of people and the planet — a system that could include elements of capitalism and all the other ism’s if and when those elements demonstrably support well being. To get there, we need a strong gross national happiness movement. Very personally, in this subset of the larger movement for climate justice, we are the ones we’ve been waiting for. And we have a lot of work to do! In other words, a GNH paradigm. I initially read Gilding’s book sitting in the warm Alabama sun while visiting my very pregnant daughter. About to give birth to a brand new person, she didn’t enjoy hearing about the “millions of people dying” prediction. I, however, was much more struck by Gilding’s emphasis on economies of happiness. Really, I was stunned when I read that millions and millions of people around the planet are already working on developing economies of happiness. “It is time to speak your Truth.